If you are looking for a set of cookware that provides outstanding quality while taking up as little space as possible in your kitchen cabinets, you're going to love Calphalon's Premier™ Space Saving Cookware. Its unique design allows for easy stacking and nesting, greatly reducing the amount of space needed to store the full set. As a long-time Calphalon cookware user, I have been a big fan of the brand since I purchased my first frying pan from them in or around 1999. As a long-time RV traveler and recent purchaser of a small vacation home with very limited cabinet space, I am also very aware of the importance of finding cookware that takes up as little room as possible. With that it mind, it's not surprising that I was really excited to be invited to review the new Calphalon Premier™ Space Saving Cookware set, which was just introduced to the retail market in September of 2017. I have to admit that I was a little skeptical of the company's claim that this set would save "save 30% more space" than other similar sets, but I quickly saw for myself just how accurate this statement really is. 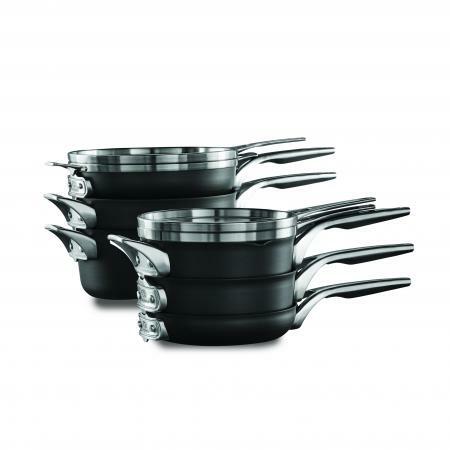 Calphalon's Premier™ Space Saving Cookware comes in a ten piece set designed to minimize the amount of storage space that is needed. The set includes six pots and pans and four lids. Two options are available: (1) stainless steel and (2) hard anodized nonstick with stainless steel handles. The lids are made of tempered glass surrounded by stainless steel and also have stainless handles. Both types are dishwasher-safe and can also be used in the oven. I received a set of the nonstick style for this review, and I am extremely impressed. While the pots and pans in most cookware sets will nest fairly easily, the lids always seem to pose a unique challenge. That is not the case with this line. The lids are flat, which is truly a genius design idea. The fact that the lids are flat means that they are stackable with the pots and pans, rather than having to have separate space allocated to them within your cabinets. Both the lids and the individual cookware pieces have notches that fit together, making it easy to know exactly how to position them for secure stacking. Plus, the pots, pans and lids stack and nest in any order. You can nest the pots and pans together and then stack all of the lids on top. You can stack all of the lids together and then place the nested pots and pans on top of them. No matter what order you use, you'll find that the pots and pans in this set fit together perfectly. My cabinet has a shelf in it, so I have the entire set stored in a cabinet in just two stacks - one for the sauce pans and sauté pan and one for the frying pans and stock pot. If your cabinets don't have a shelf, you could arrange them in a single stack. You can check out this terrific cookware set in action (and learn how to make tasty and healthful grain bowls!) by viewing this informative video (below) from Williams Sonoma. I also love the fact that the pots and pans in this set can be used with induction cooking surfaces. I have a Precision Induction Cooktop that I often use in my vacation home (it doesn't have the best stove), as well as on RV camping trips (I don't like to use the built-in stove in the camper) and during outdoor gatherings where electricity is available (back yard cookouts, anyone?). Not all of the other pots and pans that I have will work with an induction cooktop, so it's great to know that I can use any of the pieces in this set with it. Calphalon has a much-deserved reputation as a high-quality cookware company - so much so that Consumer Reports includes the brand in its listing of "cookware brands that matter." That quality is evident in this line. All the Calphalon cookware I have owned has been of the hard anodized variety, which I love because of its durability and even heating. I am also thrilled by the fact that you can safely use metal utensils with the nonstick surface used in this line, as I have had problems with that in the past (with other cookware brands). While I haven't personally tried this brand's stainless steel pots and pans, reviews on sites like The Cookware Advisor and Kitchen Life 101 indicate that they have the same high quality workmanship and performance that are associated with the Calphalon name. This cookware line is wonderful for anyone who likes to cook with high quality cookware, and it is ideal for any situation where space is at a premium. For someone like me, with a small second home and an RV, it's invaluable. It is also great for any home with a small kitchen (including tiny houses) or limited cabinet space, apartment living, college dorms where residents have kitchen access and more. Of course, even if a lack of space is not a concern, this is still a fabulous option. Even those who have plenty of cabinets can benefit from having cookware that is so easy to store and organize - and can likely definitely find something productive to do with the extra room! Calphalon's Premier™ Space Saving Cookware is available from a wide variety of retailers, including Crate and Barrel, Williams Sonoma, Bed Bath and Beyond, and many others. You can also order online directly from the company's website. Disclaimer: The author was provided with a no-cost cookware set from Calphalon in order to be able to complete this independent product review. The opinions shared here are her own.